If you’re looking for a quick and tasty dip that’s actually healthy, this Greek Yogurt Garlic & Dill Dip is your answer! Not only does it take 5 minutes to make, but it’s packed with some serious flavor and nutrition. This dip is great as a snack paired with fresh veggies, and is also a crowd pleaser at football tailgates or parties. Best of all, you won’t feel guilty about overindulging with this dip because it has zero fat, is super low in calories, and has a good amount of protein per serving. Side note: This video was originally recorded via Facebook Live. If you haven't done so already, follow me on Facebook @ksampayofitness to see more cooking and fitness demos LIVE every week! Don't have Faceook? Subscribe to my YouTube channel to watch them instead! 1. Combine the chopped dill, minced garlic, lemon juice and salt in a small bowl. 2. Let the dip sit in the fridge for about 5 minutes, to let the flavors marinate. 3. Serve with fresh veggies such as cucumbers, snap peas, carrots, and peppers. NOTES: Store leftovers in an airtight container in the fridge for up to one week. Want more healthy, tasty, and quick snack ideas? 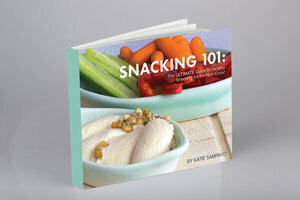 Get my FREE eBook, Snacking 101: The ULTIMATE Guide to Snacking Healthy for the Non-Cook! by signing up for my email list to the top right, or if you're on a mobile device, below, today! *Photos were taken by Julie Fisher, a photographer based in the DC/MD/VA metro area. Julie will shoot on location for your engagement, family portrait, headshots, or for any special event. With great attention to detail, Julie believes in creating a fun, comfortable environment to capture beautiful moments. Her photo sessions and editing can be customized to your preference at an affordable price. Check out her work at jcfisherphoto.wordpress.com or contact her at jcfisher90@gmail.com today!